Clark Ashton Smith’s most popular short stories take place in a land he called Zothique, the last continent on our dying earth. It rose out of the sea and its people have forgotten modern technologies, customs, and religions. Instead they worship strange gods and practice sorcery. Smith’s 16 complete ZOTHIQUE stories were published in Weird Tales from 1932 to 1953. They’ve since been reprinted in several collections and, because they’re in the public domain, posted with the Smith family’s permission at Eldritchdark, a fan website. Some of the ZOTHIQUE stories are also available in audio format for $4.95 for members at Audible.com. These are produced by Ziggurat Productions and narrated by Reg Green. I listened to The Charnel God, which was 1.25 hours long. It was originally published in Weird Tales in 1934 and put on audio in 2010. In The Charnel God, Phariom and Elaith, young newlyweds, are forced to stay overnight in the city of Zul-Bha-Sair where Mordiggian, the god of death, claims any who die within its walls. When Elaith has a seizure and becomes unconscious, Mordiggian’s necromancers arrive to claim the body. But Phariom isn’t ready to give her up, so he bravely decides to stand up to the frightening minions of the death god. The edifice was built of a strange stone, hued as with the blackish purple of carnal decay: a stone that refused the ardent luster of noon, and the prodigality of dawn or sunset glory. It was low and windowless, having the form of a monstrous mausoleum. Its portals yawned sepulchrally in the gloom of the cedars. Fortunately, Clark Ashton Smith knew when to stop. I like short doses of his intense, frenzied stories when I’m in the mood for something creepy, and Smith delivers just the right amount. The Ziggurat audio production, however, adds in ominous music and sound effects such as footsteps, rustling cloth, and creaky doors. This was completely unnecessarily and, frankly, annoying. At the end of the story there is 9 minutes of music tacked on and there are a couple of other shorter musical interludes during the story. Thus, more than 10% of the audio story I purchased consisted of no story at all. 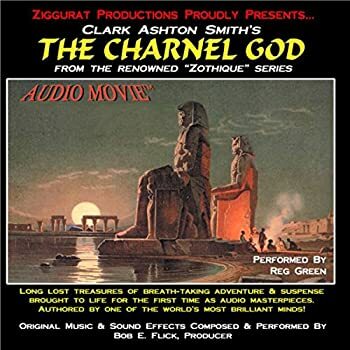 I liked Reg Green’s reading — his voice is suitable for this dark tale — but I’ll probably read the rest of Clark Ashton’s ZOTHIQUE stories in another format, perhaps even online, unless I see these on a really good sale. The Charnel God — (1934) Publisher: Zothique is Earth’s last continent in the very distant future when the sun has grown dim, the world has grown old, and the remorseless seas have overwhelmed all other continents. The sciences have been forgotten as the shadowy arts of sorcery and magic have been reborn. The result: a dark world of mystery in which luxurious kings and wandering heroes venture across dim landscapes, pitting their strength and wisdom against powerful wizards, necromancers, and alien gods, all under a dying sun. In The Charnal God a young couple stops for lodging in the wrong place — the infamous city of Zul-Bha-Sair! Unbeknownst to Phariom and his wife, Elaith, Zul-Bha-Sair is home to Mordiggian, feared god of all who die within his territory. When Elaith falls ill and lapses temporarily into unconsciousness, shadowy agents of Mordiggian arrive and whisk her away to the god’s massive temple. Left with no other option, Phariom attempts a danderous mission to locate and rescue his stolen wife. This is a nail-biting journey into the world of darkness, suspence, and necromancy.